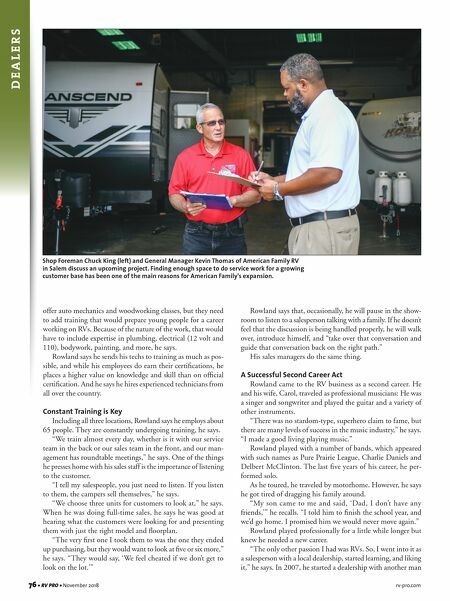 rv-pro.com November 2018 • RV PRO • 77 who was the dealer principal. After a few years, he decided to strike out on his own and founded American Family RV in Chesapeake. Hard Work Pays Off His years in the music industry taught him to work hard, Rowland says. "Everyone thinks there's so much glory, but to do it profes- sionally and make a living and support a family, it is the single hardest job I have ever worked in my life," he says. "I think the music world helped me in the RV business because it built work ethics that are unparalleled." American Family RV emphasizes family in a number of ways, Rowland says. For starters, it's owned by Layne and Carol Rowland, a husband-and-wife team. Not simply a partner in the business, Carol Rowland "is so much more. She's the accountant, she's the glue that holds the dealership together," her husband says. Their son, Clay, has been working at the dealership since high school. When he graduated from college, Rowland started him at the bottom and has placed him in different positions each year so that he can learn all aspects of the business. Technician Richard Schiff repairs a bumper on a camper at the American Family RV store in Salem. Learn More: www.progressivedyn.com | (269) 781-4241 FEATURES: • Four-Stage Charging System • 3 Diode Isolated Outputs • Over Voltage Protection • Programmable in the Field • Regulated Output Voltage • Automatic Over-Temperature Shutdown • And More! 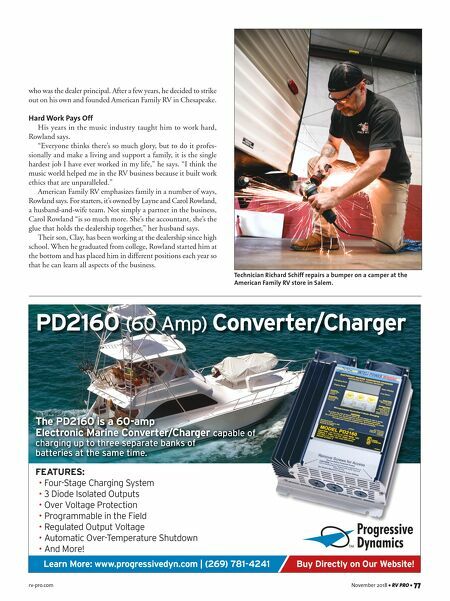 The PD2160 is a 60-amp Electronic Marine Converter/Charger capable of charging up to three separate banks of batteries at the same time. PD2160 (60 Amp) Converter/Charger Buy Directly on Our Website!